Heading South, Going Indigenous | What an Amazing World! Sitting on a bench at Taipei Main Train Station, we tucked our luggage between our feet – 2 backpacks of mine, 1 backpack and 1 small suitcase of James’ – while waiting for our train to Taitung, a small town at the eastern coast of Taiwan roughly 350 km from Taipei. We would spend a night in the small city before flying to Orchid Island, the most anticipated leg of the trip. 3 minutes before the time of departure I started to get anxious, realizing that we should have boarded the train by then. Yet there was no sign that our train has arrived. I stood up and walked towards the edge of the platform, trying to find out what was happening. An old train was stationed at the far end of the line, completely unseen from our bench. My gut instantly told me that it was our train and we had to get on that train right away. Without any hesitation I dashed towards an officer standing right outside one of the carriages with James following closely behind. After confirming that it is our train, we immediately jumped inside and looked for our carriage. A short moment afterwards the train started to move and slowly left the platform behind. We were that close to missing the train indeed. The Tze-Chiang Express, literally “striving to become stronger”, looked so much different from what we anticipated. 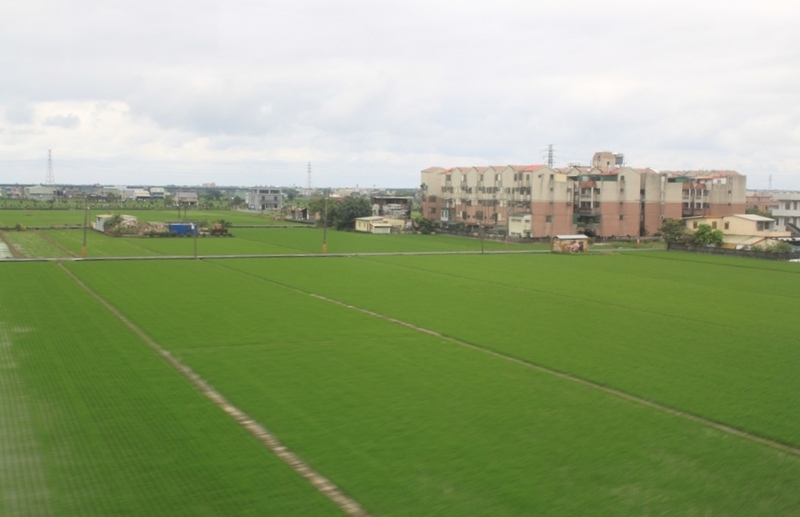 Unlike the western coast of the country which is served by the sleek and modern Taiwan High Speed Rail trains – with the maximum speed of 300 km/h – the train journey along the east coast of the Taiwanese mainland was a lot more old-fashioned, and in many ways nostalgic. A few minutes after leaving the Taipei Main Train Station, the subterranean railway arose to the ground, giving us a clear view of the landscape. I was relieved when rows of dull and dreary apartments changed into lush vegetation on mist-covered hills and mountains as the train moved further south. The view brought back the memories of Laos, especially the 11-hour land journey through Route 13 where I witnessed the true beauty of the natural landscape of Laos. Our train stopped at several small stations, giving me the glimpse of how people live in the countryside. In many ways they looked more traditional and laid-back than their fellow countrymen in Taipei, but occasionally I noticed some young people dressed up in very edgy – sometimes gaudy – outfits. 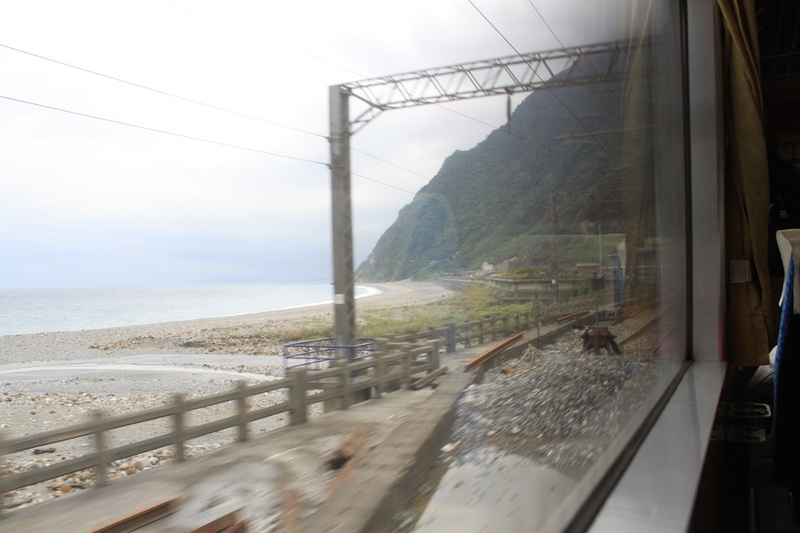 At Hualien station, roughly halfway between Taipei and Taitung, most of the passengers got off. “Most likely they went to the hotsprings or Taroko Gorge” James explained. 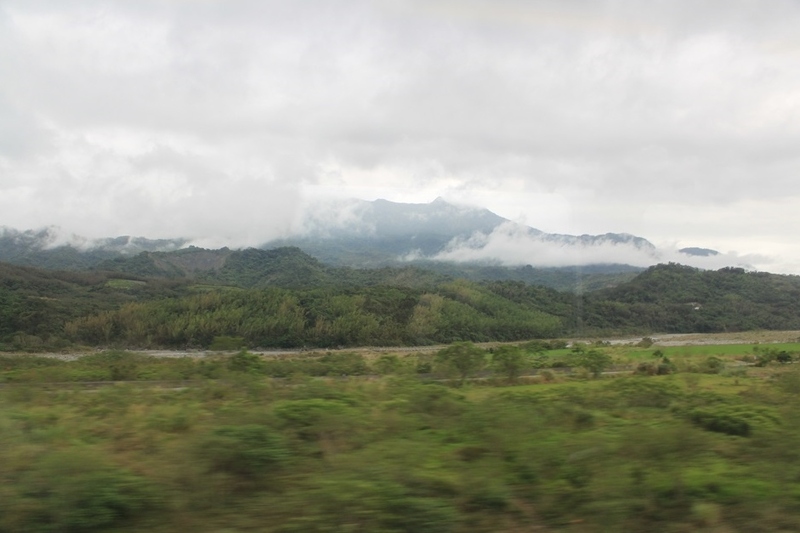 After halting for a few minutes – longer than in previous stations – the train continued moving to Taitung. The multi-language announcement during our train journey reminded me of the same thing on my way from Cologne to Brussels where announcements were delivered in German, French, Dutch and English. In the meantime on this journey to Taitung they were delivered in Mandarin, Taiwanese (Hokkien), Hakka, and English. However from Hualien Station onwards one other language was added. “Kita serikaka mengapai tuku.” The foreign yet strangely familiar language picked up my curiosity as it sounded quite similar with Tagalog or Bahasa Indonesia. I listened again carefully and tried to understand what that means by comparing with the English version. I was surprised to find out that kita means ‘we’ – exactly the same word we use in Bahasa Indonesia – and mengapai might have the same meaning as menggapai, a word in Bahasa Indonesia which means ‘to reach’. It reminded me of the theory that Taiwan might be the place where the ancestors of the Austronesian peoples – those living in Indonesia, Malaysia, the Philippines, Brunei, also as far as Madagascar to the west and Easter Island to the east – were from. 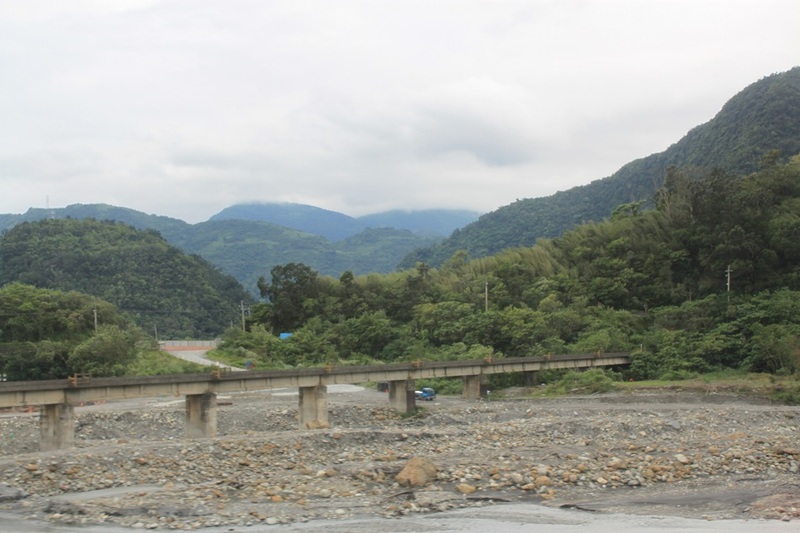 A study shows that the languages of the indigenous people of Taiwan form the greatest genealogical diversity among other places in the Austronesian language group. 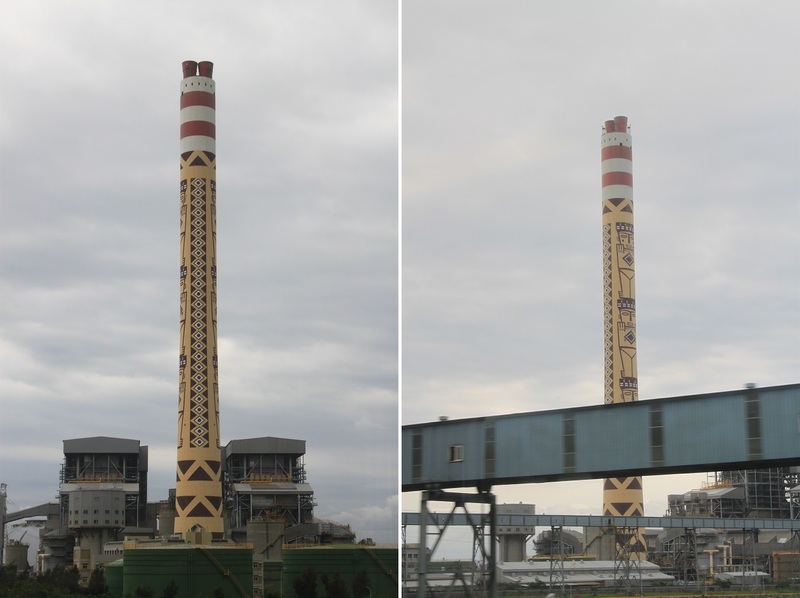 The train kept moving towards Taitung when suddenly I saw a tall chimney painted in a rather unusual way. Instead of baring the color of the concrete, it was covered with aboriginal patterns, looking similar with the indigenous patterns I saw in some parts of Indonesia. Going further south I realized that this trip – especially in Orchid Island – would become a trip of retracing my ancestors’ trails. Great post Bama! If you hadn’t pointed out that smokestack with the aboriginal patterns I would probably never have noticed. 🙂 It’s so good to see that Taiwan is finally embracing its indigenous roots. Thanks James! That really caught my attention as I never saw such a colorful smokestack before. It’s about time for Taiwan to embrace the rich cultural heritage it has. Your words always paint such a beautiful picture of your travels. It’s wonderful that someone painted the aboriginal patterns on the chimneys, showing us something of the people who them. And it could have just been a boring old chimney! I look forward to the next leg of your journey! Love the way u pick ur words. By reading this, I feel there inside ur story and enjoy the trip as well. Have u written a book about your travel experience? Can you guess my favorite shot from this post? Hint : human interest! I love it Bam! You seldom take pictures in human interest area, and this one is great. It describes the relationship of family boldly here, and I bet most people can relate to this. Well, I had no plan to take such picture, especially when I was aboard a train. 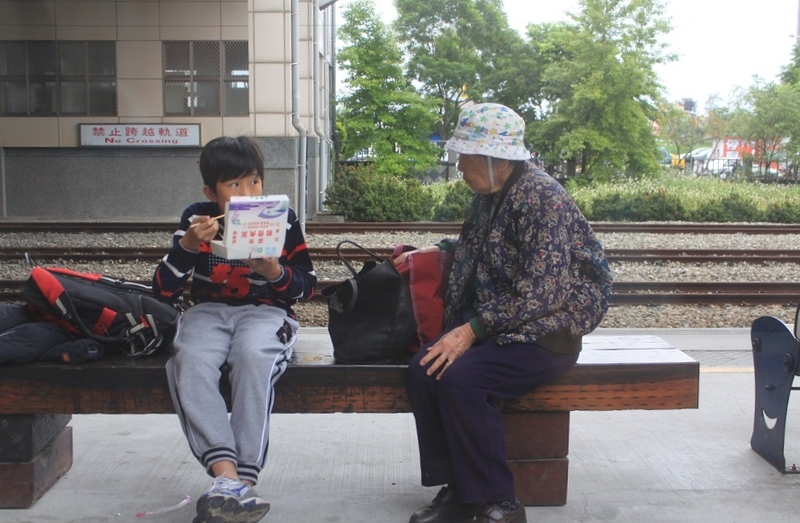 But when the train stopped at a small station, there were this boy and his grandmother. Looking at them made me smile, so I grabbed my camera and took some pictures of them. Thanks Bin! Hi Bama, what an interesting journey of discovery. It gave me chills that you were unknowingly discovering your roots. Can’t wait to read the next one. Thanks Jill! I’m writing my next post on the islanders but I’m a little bit behind. Work has been busy lately, but I hope I can finish it next week. You’ll find it fascinating how much similar the locals are with Indonesians. I was fortunate to be able to take one photo before the train departed that small train station. That’s such a sweet moment between the two, indeed. Yes, it is. Nggak main ke Kaohsiung sama Tainan, mas?